If you are dieting and exercising in order to lose or maintain your weight, there’s one more thing you need to prioritize on a regular basis – getting a good night’s sleep! 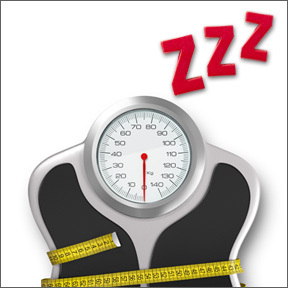 Scientific evidence supports sufficient sleep as a critical component of weight control in that people who maintain a regular sleep schedule have a lower percentage of body fat than those who are sleep deprived. Insufficient sleep promotes hunger and increased appetite and harms the body in other deleterious ways. Sleep deprivation affects appetite hormone regulation and the ability of our fat cells to respond to insulin. When insufficient sleep alters the circulating levels of hormones that regulate hunger, increased appetite and the propensity to overindulge in calorie-dense, high carbohydrate foods results. Most of us realize that after a poor night’s sleep we don’t function at our best. We may feel tired and irritable, lack energy and motivation, and have a diminished ability to create and concentrate. However, we may not realize that our food choices and cravings can all be linked to the amount of sleep we get each night. Sleep is a major regulator of the hormones ghrelin, which triggers appetite, and leptin, which signals the brain that you have had satisfied your hunger. More and more, science points to a relationship between how many hours we sleep and the amount of food we eat, the time of day we eat and what we choose to eat. Weight management requires a balance between two energies – the energy we get from our food intake and the energy we expend from our daily activity. Short sleepers tend to eat enough food at night to exceed the energy they expend by staying awake. Although it’s unclear why lack of sleep affects our food choices, the more sleep deprived we are, the worse our choices become. Simple carbs become far more interesting than healthier fruits and vegetables. One possible reason may be that the brain, which is fueled by glucose, becomes stressed by lack of sleep. Or we may just be so tired that we lack the motivation to choose more nutritious foods. Trading sleep for excess calories is not a healthy trade. Our lifestyles don’t really stress the importance of sleep. Many of us may find ourselves watching late night TV, catching up on emails, playing video games or surfing the internet, all of which interfere with the production of melatonin that signals our brains when it’s time to sleep. Some of us may find ourselves sabotaging our sleep and wearing a path from the TV or computer to the refrigerator. Besides avoiding an intake of an excessive amount of calories, there are other very good reasons to get your share of healthy sleep. While we are sleeping, our bodies are building, repairing and rejuvenating body tissues, our brains are forming critical memory pathways, and our organs and systems are actively working, all critical processes for optimal health. While sufficient sleep may vary from person to person, the National Sleep Foundation recommends that adults get 7-8 hours of sleep nightly. Up to 40% of Americans regularly “get by” on less, but it doesn’t necessarily mean they should. Significant sleep debt can trigger metabolic and endocrine changes that are characteristic of unhealthy aging. Inadequate sleep can foster insulin resistance, a risk factor for developing Type 2 diabetes, and chronic lack of sleep can lead to hypertension, anxiety, depression, heart attack, or stroke. In short, sleep deprivation increases hunger, gives us more hours in the day to eat, prompts us to make unhealthy choices, and makes us less likely to exercise, all of which increase the risk of weight gain, obesity and chronic disease. Of course, sleeping can’t take the place of a healthy diet and exercise but it is just as essential to your wellbeing. Changing your habits can help you in your quest for optimal sleep and, over time, the quality and quantity of your sleep may help you shed pounds. Set a consistent bedtime, avoid caffeine after mid-afternoon, spend some time relaxing and unwinding after a stressful day, and turn off all electronics well before bed time. Making a good night’s sleep a priority can boost your mood, attentiveness, mental alertness, patience and productivity and aid you in your quest for optimal weight and wellness. Kavinace Ultra PM by NeuroScience – One of our most popular supplements, Kavinace Ultra PM contains a proprietary blend designed to support the calming neurotransmitters and hormones that promote a normal sleep cycle and restorative sleep. Gluten and soy free, vegetarian formula. Melatonin PR 3 mg Prolonged-Release (83199) by Douglas Laboratories – This pure, pharmaceutical grade melatonin is designed to aid in the regulation of sleep/wake cycles, support normal immune function and provide free radical protection. Gluten, soy and dairy free, vegetarian formula. Melatonin Liquid by Pure Encapsulations – This naturally flavored, convenient formula nutritionally augments pineal gland function, supporting the body’s natural sleep cycle without morning drowsiness. Gluten and soy free, Non-GMO vegetarian formula. L-Tryptophan (SA501) by Thorne Research – As a serotonin and melatonin precursor, this amino acid supplement promotes relaxation, healthy sleep and good mood. Gluten, soy, and dairy free, Non-GMO vegetarian formula. This entry was posted in Home and tagged Kavinace Ultra PM by NeuroScience, L-Tryptophan (SA501) by Thorne Research, Melatonin Liquid by Pure Encapsulations, Melatonin PR 3 mg Prolonged-Release (83199) by Douglas Laboratories. Bookmark the permalink.